AS&V continues to lead the field in the British Light Music genre with a plethora of issues culminating in this 5th edition of 'Discoveries'. 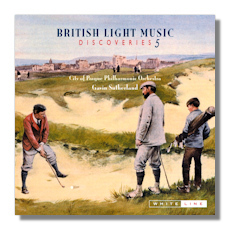 What makes these discs very attractive is their beautiful covers depicting a nostalgic evocation of British sport with this release featuring a golfing excursion. Sutherland has assembled a number of interesting pieces beginning with the aptly titled 'Kaleidoscope' by John Hope. I enjoyed Fox's 'Pastoral Reflection' and Lewis' pompous 'Inauguration' but the real highlight on disc must be Barbirolli's arrangement of a Handel Clarinet Concerto which includes some memorable tunes. Toye's 'haunted Ballroom' waltz has appeared on other compilations before, most notably Ronald Corp's unmissable British Light Music Classics 1 on Hyperion and Sutherland gives this popular piece much drive and momentum. Pitfield and Sutherland's overtures are also very entertaining. Philip Lane's short notes are ideally suited to the collection and collectors of the previous issues will obviously not hesitate.